Another big European night on the cards at Old Trafford. A chance to make history like Manchester United did in the previous round against Paris Saint-Germain. But Barcelona are a totally different animal. A football club deserving of elite status, whereas you just feel PSG are something artificial. Not quite as genuine. Sure, Barça have their faults too but they’re a proper football institution. 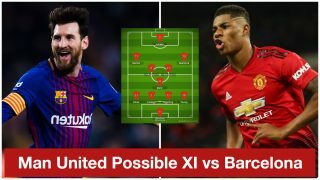 Manchester United vs Barcelona is always an incredible tie. Anyhow, how will the Reds line-up for the first leg against the La Liga champions? De Gea hasn’t been his best this season but he is still the first name on the team sheet. Ole Gunnar Solskjaer might opt for Young’s experience over Dalot, but the young Portuguese full-back could offer something from the bench in a more attacking role. The partnership formed by Smalling and Lindelof has been the best for Solskjaer, albeit far from ideal against a side like Barcelona. So, is Herrera going to return for the big game? He apparently picked up a knock for the defeat against Wolves, but there’s been tons of speculation about a Bosman switch to PSG. United also need Pogba to be at his best – with and without the ball – though Matic only fills us with doubt ahead of this fixture. His lack of mobility and pace has been a constant issue for United this season. Ok, this might be too attack minded, but United are at their best under Solskjaer when they take risks. I would want all three of these players starting to give us the best chance possible of going into the second leg with a positive result. Three players hungry for goals but this also means the midfield needs to disciplined and equally potent in the final third.